Step back into the era of the musical greats and be lavishly entertained by the songs of Judy Garland, Edith Piaf, Patsy Cline, Billie Holiday and Maria Callas. Songs for Nobodies is a revue-cabaret show written by Joanna Murray-Smith and performed by Bernadette Robinson, paying tribute to the iconic songstresses we know so well. Following a highly lauded season at Wilton’s Music Hall, the show transfers to the West End’s Ambassadors Theatre, where it will play for a strictly limited run. Presented as an assemblage of stories, Songs for Nobodies tells of the ordinary women who happened to meet the five stars of stage and screen. Along the way, well-known songs are faithfully performed, from sultry blues to virtuosic soprano. Robinson embodies each of the singers, conjuring the glamour and nostalgia of a bygone era onto the stage. She is joined onstage by a live orchestra. The capaciously talented Robinson is a singer and actor hailing from Australia, who counts a Helpmann Award 2012 nomination for Best Female Actor in a Play to her name. Joanna is a Melbourne-based writer whose credits include Honour, which has been internationally produced and Scenes from a Marriage. Director Simon Philips has worked on myriad classic plays, musicals and opera, and was Artistic Director of the Melbourne Theatre Company until 2011. 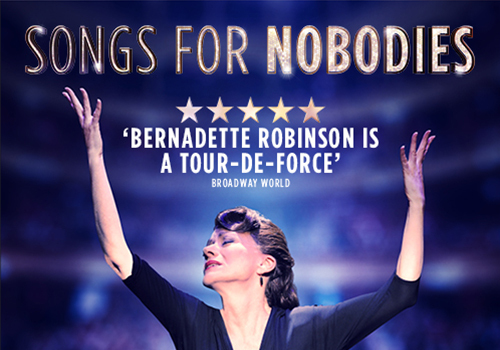 A heart-soaring celebration of music, cabaret and five women immortalised in the showbiz halls of fame, Songs for Nobodies promises to send its audience singing all the way home. The age recommendation for Songs for Nobodies is 8+, with a minimum age admission of 5. The show contains some smoking and drinking.